Where Can I Buy a Barrel of Bourbon? Looking to win over your future father-in-law this holiday season? Look no further. Think big. Think bourbon. Well, we have the inside scoop for you. For those at a loss on what to buy the person on your list that has everything, think big – buy a barrel of bourbon. We have the inside scoop on a couple of unique experiences for the ultimate bourbon lover. Here at Mint Julep Tours, we can do all the planning for your private barrel selection at a handful of distilleries. We plan your ultimate experience and coordinate your transportation (because you don’t need to sample barrel proof bourbon and be driving yourself around Bourbon Country). Buffalo Trace Distillery, located in Frankfort, Ky., offers bourbon enthusiasts the unique opportunity to hand-select their very own barrel of premium bourbon. Visit the Trace to experience an amazing day of southern hospitality and leave with the ultimate souvenir! The road to buying a barrel begins with selecting a brand such as Buffalo Trace, Eagle Rare Single Barrel, Elmer T. Lee Single Barrel or Blanton’s Single Barrel. The barrel buying experience begins upon arrival at the Trace. Guests are greeted by the Buffalo Trace staff. One of the distillery’s expert tour guides will then lead a behind-the-scenes tour to educate guests on the finer points of bourbon distillation and the rich history surrounding the bourbon industry. The barrel selection takes place in the legendary Warehouse H. Warehouse H is the only metal-clad warehouse at Buffalo Trace and it houses all of the Blanton’s Bourbon. Blanton’s is the original single barrel bourbon, first released in 1984. 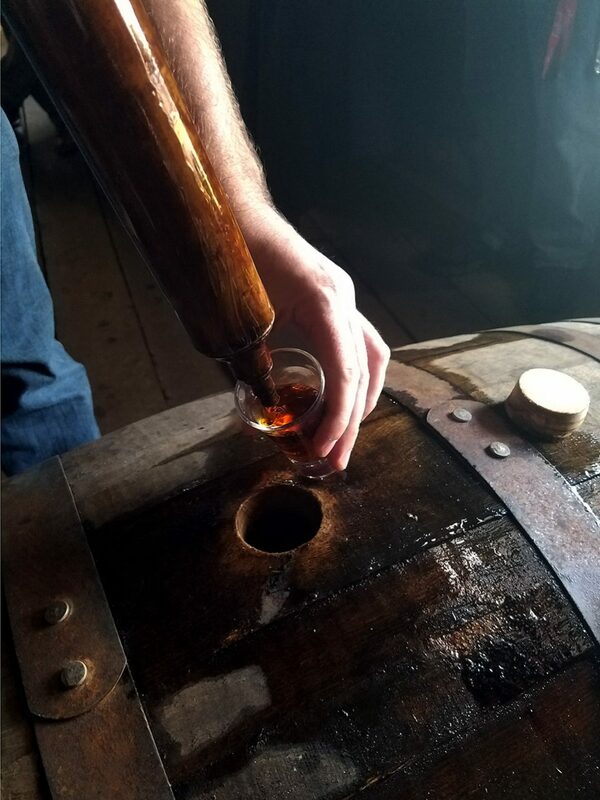 The bourbon samples are taken directly from the barrel. Tasting is done at barrel-strength and then again cut to 60 proof. This allows the products’ natural aromas and flavors to come through. After selection, the barrel will be pulled aside and prepared for bottling. Each bottle of bourbon will have a custom sticker or tag, letting everyone know it was specially selected. Once the bourbon is bottled it will go to the distributor and then to a local liquor store for pick up. Plus you get to keep the barrel too! Prices and quantities of barrels vary depending upon the brand and how much the barrel yields. All bourbon is paid for the at the consumer’s local retail outlet. As a part of our Four Roses experience, Four Roses invited folks out to the Cox’s Creek bottling and aging facility to begin the tasting process. There you can sample all TEN Four Roses exclusive formulas directly from their respective barrels. Some selections are under the guidance of Hall of Fame Master Distiller Jim Rutledge. After the selection, your barrel is bottled and you will receive your bottles with your individual custom label at full barrel strength. The entire barrel yields close to 200 bottles. Most distilleries start their buy-the-barrel programs around $8000. It can take upwards of two months to get your private selection bottles to your house. Buying a whole barrel not in the budget? Talk to your Mint Julep Tours experience coordinator or tour leader about the best bars, restaurants and liquor stores in Louisville or around Kentucky to find hand-selected single barrel bourbons. Many local spots, like Doc Crow’s, Haymarket Whiskey Bar and Liquor Barn, frequently do their own selections to serve or sell. To coordinate your custom tour, fill out this form.